He took over direction of the Miami Athletic Department amidst one of the school's most successful eras, but Sam Jankovich did more than just oversee during an era in which Miami teams won six national titles. Jankovich, a fundraiser of the highest order, fostered impressive growth of UM's athletics fundraising efforts during his tenure in Coral Gables. Miami teams won national championships in women's golf (1984), baseball (1985), women's tennis (doubles, 1986), men's tennis (singles, 1987) and football (1987 and 1989) during Jankovich's reign, but his lasting impact on UM athletics is felt in the area of fundraising. 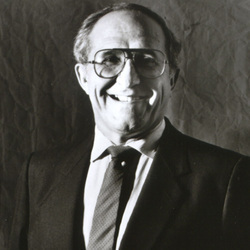 Jankovich was instrumental in a four-fold increase in annual gifts to UM athletics during his time as athletic director as the department's annual gifts rose from $750,000 in 1982 to $3 million in 1990. Major facilities improvements also were a byproduct of Jankovich's stewardship as the $1.1 million Knight Sports Complex was completed along with the Tom Kearns UM Hall of Fame Building, the Golden Cane Football Office Building, renovation of the Hecht Athletic Center, construction of the Ron Fraser Building for baseball, and additions to the Neil Schiff Tennis Center. Jankovich also was a force in the revival of UM's men's basketball program, overseeing the program's rebirth in 1985 into a nationally competitive program. Jankovich was nationally recognized as one of the leading visionaries in college athletics, as exemplified by his appointment to president of the NCAA Division 1A Athletic Directors and his inclusion on the Executive Board of the College Football Association.